In all the news and reporting about Earth Day, it’s hard to ignore some people’s frustration about the lack of recycling plastic bags, bottles, etc. The national recycling rates in the U.S. seem to remain at about 34%. Honest Tea, the organic bottled tea company, is launching a new, national recycling initiative called “The Great Recycle,” which will take place in New York City’s Times Square on Monday, April 30th. In a show of support for New York City’s pledge to double recycle efforts by 2017, Honest Tea and partners GrowNYC, Recyclebank, Coca-Cola Live Positively, Global Inheritance and Five-Boro Green Services will place a 30-foot tall recycling bin in Times Square and attempt to crowd-source recycle more than 45,000 plastic, glass and aluminum beverage containers in ten hours. The plastic bottles collected will be recycled into gardening supplies including shovels, watering cans and plastic lumber, which will be used to build and cultivate an urban garden for PS 102, an elementary school in Harlem. On April 15, artist Katharine Harvey unveiled her 21-foot tall, 15 foot wide sculpted chandelier at New York City’s World Financial Center Winter Garden. The chandelier is produced with thousands of used plastic containers. Also, don’t forget about ReThink Fabrics, a company we covered a few weeks back that is a branded manufacturer of t-shirts and apparel produced with recycled PET bottles. The company’s signature line of t-shirts is made from 100% post-consumer recycled polyester RPET fabric. Now it’s your turn. Share your company’s story about sustainable practices in plastic packaging. Or talk to us about your company’s recycling initiatives. 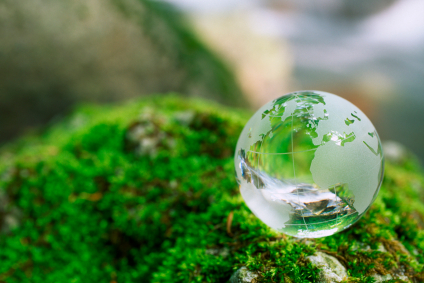 How will you celebrate Earth Day? Let’s get a conversation started!